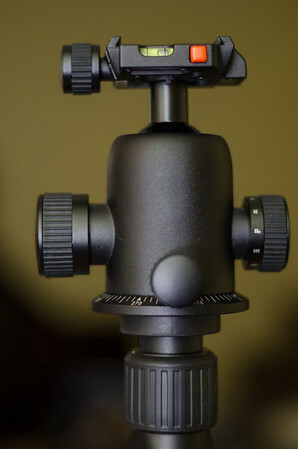 So, what does $70 get you when it comes to a tripod head, or maybe more to the point, what improvements can $70 buy me? My tripod came with a fairly crappy head. Like I said before, it got the job done, that’s about it. When I twist the lever to lock the head down, I had to point the camera higher then where I wanted it due to the large amount it would settle. If I wanted to pan, I’d have to loosen and recompose. It was frustrating to say the least… It states that it can only hold 8.8lbs, and I think it might be less then that. So, how does the SBH-250 improve? Loading: The SBH-250 states that it can hold 44lbs. I haven’t tested that and never plan to… The heaviest combination I could see having on there would be maybe 10lbs (camera + grip+flash+70-200) and it seems like it’s plenty strong enough. Stability: Once that head is locked down, it doesn’t budge! It has two head adjustment knobs. The one on the left in the first image controls the resistance when it’s unlocked. The one on the right locks it down. It only takes a 90 degree turn to lock down. All of the knobs have a really nice solid feel to them and seem to have tight tolerances. The resistance adjustment is really nice, I can calibrate the unlocked resistance to the weight mounted so when I unlock it it wont move unless I move it (so I could potentially do it with one hand!). P late: This is where the camera attaches to the camera. It’s a lot slimmer then my previous head. If I had to say I had a gripe with this tripod head, I think it’d be here. It appears that to make plate slimmer they made it more difficult to remove. You’ll need to have a screw driver, a coin, a key or some other tool to take it off. Not a deal breaker by any means, but kinda annoying. The plate attaches firmly to the camera and the non-skid pads make it so it doesn’t move when tightened. The plate attaches to the head by sliding in from one side or the other. There is a locking pin in the head that is depressed by the sloped channels of the plate so it slides on easily. Once on, the pin keeps it from coming off. You press that orange button to lower the pin. The knob that locks the plate in place only takes a 45 degree turn. There are two bubble levels build into the head to help level it. They work as expected. Misc: It also comes with an extra plate which I thought was a nice touch. 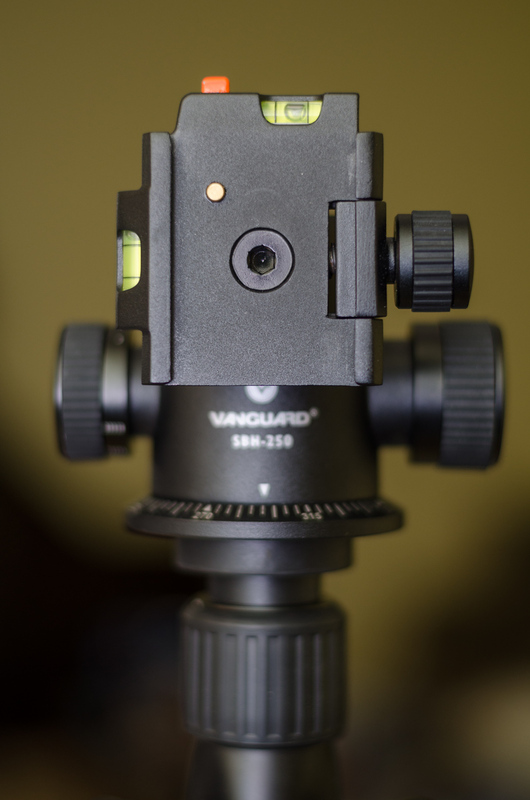 It comes with an adapter that reduces the standard 3/8″ attachment thread down to a 1/4″ thread where you attach to the tripod. Conclusion: For only $70, I can’t see how you could go wrong. Everything feels solid, seems to be made very well. The only thing left to do now is use it. I’ll update this post if it starts to wear out in anyway. Cons: The screw for the plate requires a tool. Really only a problem if you’re lazy like I am. Now I just need to get a better tripod! As usual, if you have this head or have used it, feel free to comment with your opinion. 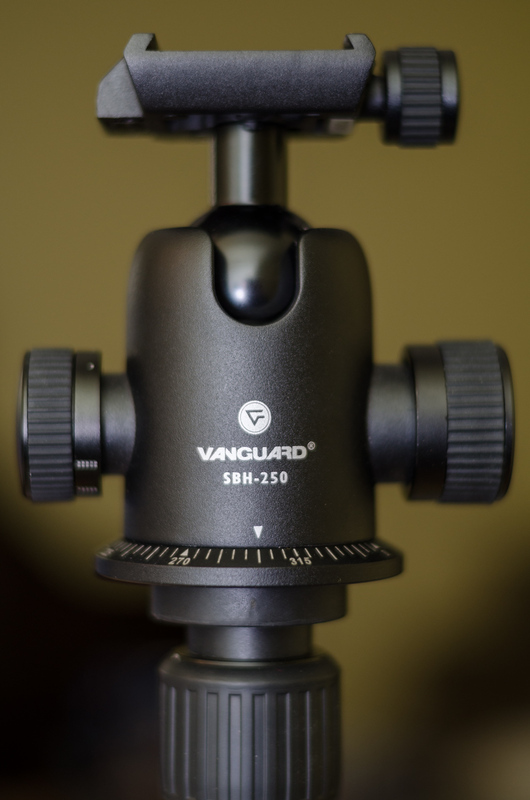 I’ve found vanguard products to be very well built. I use the Vanguard ABH-230K ball head and its solid. It doesn’t creep even with a 70-200 f2.8 on the Pentax K-5 with a grip. I am thinking in buying a Vanguard ball head SBH-250..and use it with my nikon lens 70-200 ..the question is would be any problem if I sit the lens using the collar lens?? ?